Ghizlan’s work utilises the latest in LED lighting technology. Combining Light Emitting Diodes (LEDs) with translucent materials, reflective sheets and specially designed lenses, the resulting LED back lighting system offers a slick, lightweight and dynamic lighting solution operated via a remote control. LEDs emit virtually no heat and consume very small amounts of energy making them extremely economical and virtually maintenance free. The back light omits an even spread of light in either RGBW (Red, Green, Blue, & White) or simply warm or cool light. The remote control unit offers a selection of preconfigured settings with a choice of either static colours or cyclical lighting effects, all of which can be dimmed, sped up or slowed down. 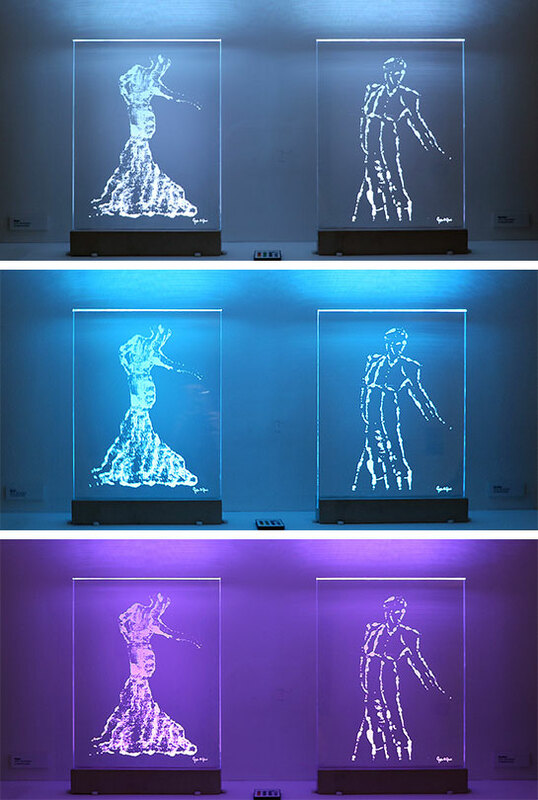 Glass illuminations use a similar lighting system, with LEDs in either RGBW or warm or cool light. The only difference being the LED configuration. Arranged on a long slim strip, the light is positioned on the edge of the glass, allowing concentrated light to travel unhindered through the glass until it hits the etched areas of Ghizlan’s art, transforming it into a glowing multicoloured or single coloured marvel. The simplicity of Light Emitting Diodes (LEDs) means there won’t ever be any bulbs to change. In fact the lifespan of LEDs far outweighs conventional bulbs. On average LEDs run on full power for thousands of hours. The Creston Lighting System also supports this technology. 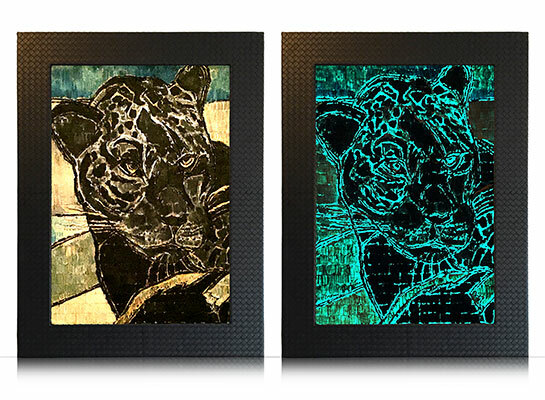 Art for the home, the office or even large outdoor spaces can now be enhanced with light… at the touch of a button.